Enjoy custom printing services, graphic design and affordable pricing, all while helping to build a stronger community. 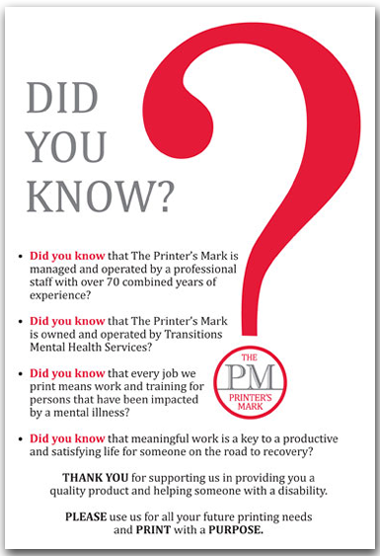 At The Printer's Mark every job we print means work and training for persons on the journey to recovery. Meaningful work is the key to a productive and satisfying life and as a division of Transitions Business Services, The Printer's Mark professional staff works with those impacted by mental health issues to bring you a quality product.